Many people who love California theme parks have no idea that Busch Gardens once existed in Los Angeles. Yet, the Los Angeles area once boasted not just 1, but 2 Busch Gardens theme parks that were operated by the legendary Anheuser-Busch beer company. Today, Busch Gardens theme parks are major draws in Florida and Virginia — but they’re no longer found in the West. The older of the 2 operating Busch Gardens theme parks opened in Tampa in 1959. But the very first Busch Gardens was located in Pasadena. 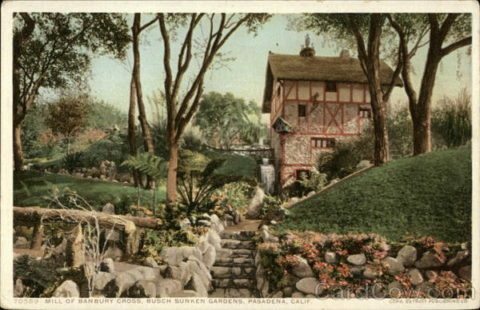 Busch Gardens Pasadena was an exquisite botanical feast for the eyes, welcoming millions of guests during the first decades of the 20th century. I’m not only a Busch Gardens historian, but I’m also a theme park enthusiast, and I enjoy sharing my knowledge of old theme parks with others. Let’s take a look back at these 2 long-lost Southern California theme parks, what made them so popular, and why they closed. I’ll also share info on where you can still find traces of the historic Busch Gardens Pasadena! In 1903, Adolphus Busch, the first president of Anheuser-Busch, began a 30-acre estate in picturesque Pasadena. The Busch property featured more than 100,000 plants, 14 miles of walkways, and a plethora of ponds and fountains. Adolphus Busch and his wife Lilly opened the gardens to the public in 1906 free of charge. Whimsical figurines representing Hans Christian Andersen fairy tales enchanted the young and young at heart, while sweeping waterfront vistas and lush sunken gardens provided a scenic backdrop that lured tourists from all over. A meticulous reproduction of the Banbury Cross Old Mill was later constructed and became an iconic landmark for the popular Pasadena park. Even after Adolphus Busch passed away on October 10, 1913, Busch Gardens Pasadena continued flourishing under Lilly’s loving care. The park was open 7 days a week during this period, and a massive team of more than 50 gardeners maintained the lush attraction. Springtime brought parties for high-rollers and Easter egg hunts for children — the latter a tradition started at the park years earlier. Why Did Busch Gardens Pasadena Close? According to records from 1915 (the year that saw 1.5 million people visit the park), annual operating costs amounted to $50,000 – a sum that almost became too great to bear after Prohibition dried up much of the beer family’s revenue during the late 1910s and early 1920s. Some of the Busch Gardens property was sold to developers, but Lilly kept much of the attraction open by granting use of the property to the Pasadena Hospital Association in 1920. The American Legion of California operated the gardens — which had a nominal admission charge of 25 cents for adults and 10 cents for children during the Roaring ‘20s, from 1921 through 1928. The lovely scenery proved a tempting backdrop for the motion picture companies, many of which shot films on the grounds during the 1920s. Lilly died in 1928, and the fate of Busch Gardens looked dire. The Unemployment Relief Group assumed operations in 1933, before handing over reigns once more to the American Legion of California 2 years later. Gone With the Wind (1939) — Check out behind-the-scenes color film from shooting of the film at Busch Gardens Pasadena in the video below! Meanwhile, the Busch Gardens property was sold off in parcels to developers — with many retaining original elements of the park. There Was Another Busch Gardens In Los Angeles? A second Busch Gardens park, this one boasting a tropical theme, opened in Van Nuys in 1964 — a decade after the adjacent Anheuser-Busch brewery came online. Busch Gardens Los Angeles offered sweeping botanical gardens, a popular bird show, a large collection of parrots and other colorful avians, boat rides, and a monorail. In 1977, the park was formally converted to a promotional facility for Anheuser-Busch — with much of the property dedicated to serving strictly as a bird sanctuary. In 1979, expansions at the brewery necessitated closure of the former theme park facility, and the birds were rehomed at the Los Angeles Zoo and the 2 Busch Gardens parks in Tampa and Williamsburg — which opened in 1959 and 1975, respectively. The incredible horticultural heritage of the Busch Gardens Pasadena park carried into the lush landscape of the Busch Gardens parks in Tampa and Williamsburg. Both of the presently operating Busch Gardens parks are notable for their outstanding landscapes. Busch Gardens Williamsburg has repeatedly won the coveted World’s Most Beautiful Theme Park Award from the National Amusement Park Historical Association. While there haven’t been any Busch Gardens California theme parks since the 1970s, there is SeaWorld in San Diego, which is operated by the same company that also owns Busch Gardens in Tampa and Williamsburg. With the closure of the Los Angeles Anheuser-Busch promotional facility and bird sanctuary in 1979, the era of the original Busch Gardens tourist attractions officially came to an end on the West Coast. But traces of these once-popular California theme parks remain today. Locals and visitors still imbibe on free tours of the Anheuser-Busch brewery at 15800 Roscoe Boulevard in Van Nuys. Meanwhile, less than 20 miles to the east, remnants of the once internationally known Busch Gardens Pasadena are tucked away along Madeline Drive, South Arroyo Boulevard, and South Orange Grove Boulevard. Many of the rustic stone walls along Busch Garden Drive and Busch Garden Court once stood in the park. A former curved pergola has been turned into a home on Arroyo Boulevard. And the iconic Old Mill, now standing in a private yard, looks almost exactly as it did a century ago! The closure of both Busch Gardens Pasadena and Busch Gardens Los Angeles left Southern California with 2 fewer amusement parks. But there were also several other California theme parks that shuttered their doors over the past decades. 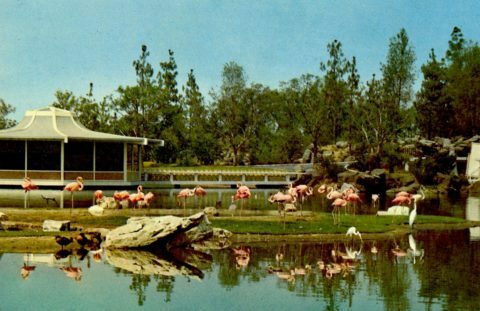 #1 – Jungleland USA (Thousand Oaks) — This zoo and theme park operated from 1926 to 1969. It served for years as a support animal training facility for Hollywood productions, many of which were filmed on property. Surrounding development and competition from other Southern California attractions forced Jungleland to close. Today, the former 170-acre theme park is The Thousand Oaks Civil Arts Plaza. #2 – Japanese Village and Deer Park (Buena Park) — The Japanese-themed amusement park opened in 1975. It featured Japanese-themed buildings, koi ponds, dolphin shows, and free-roaming deer. The park closed in 1975 and was sold to Movieland Wax Museum, which operated for short time as a Polynesian-themed park known as Enchanted Village. The park closed in 1977 and today the site of the former theme park, once located at 6122 Knott Ave, is now a business center. The last trace of the theme park is George Bellis Park. #3 – Chutes Park (Los Angeles) — Chutes Park opened in 1887 as a trolley park and eventually became a 35-acre amusement park with rides, animal habitats, and shows. It also featured an adjacent baseball stadium where the original Pacific Coast League Los Angeles Angels played. The park traded hands in 1910 and became Luna Park, which closed by 1913 upon expansion of the baseball stadium (Chutes Park ball field). Today, the site is now a multilevel mall known as LA Mart. # 4 – Pacific Ocean Park (Santa Monica) — This 28-acre nautically themed amusement park opened in 1958 as a direct competitor of Disneyland in nearby Anaheim. The park, which featured a large pier, many rides, a sea circus with performing animals, and snack bars, was an instant hit with locals and tourists — but that was to be short lived. A massive urban renewal project made getting to the park difficult in the mid 1960s and attendance steadily dropped off. The park closed in 1967 and was demolished by 1975 following fires and other vandalism. Only a few pier pilings from the attraction remain today, but evidence of the park exists on surviving film of several TV programs that were shot there, including The Man From U.N.C.L.E., The Invaders, and Get Smart. #5 – Wonderland Amusement Park (San Diego) — The first amusement park in San Diego and one of earliest California theme parks, Wonderland was a a tiny wonder at just 8 acres. Yet, the park offered dozens of diversions for its visitors, including the largest roller coaster on the West Coast at the time, a carousel, dance hall, bowling alley, and a menagerie of animals large and small. The park operated for just 2 years, losing out on attendance due to the Panama California Exposition World’s Fair, which was held in San Diego and ran from 1915 until 1917. Wonderland, meanwhile, closed by 1916. While the briefly popular Ocean Beach neighborhood landmark is long gone, Wonderland remains a vibrant part of San Diego’s history and is honored today in the historical theme of the city’s aptly named Wonderland restaurant and pub.